Attorney Jason Khano founded our Marietta law office, Khano & Associates, with the goal of assisting the residents of Cobb County, Georgia, who face legal and financial struggles. Since establishing our firm, the residents of the area have regularly turned to him and our associate attorney, Anitra Walker, for guidance through the bankruptcy* process, for a strong criminal defense and for assistance with real estate transactions. Mr. Khano, a native of Marietta, began his legal career helping predatory lending victims. This early experience inspired him to continue to work to protect the rights of the victims of financial struggles, including those who need assistance fighting for their rights under the Fair Debt Collection Practices Act. Ms. Walker began her career fighting against large insurance companies on her clients' behalves before going on to become an assistant state's attorney. 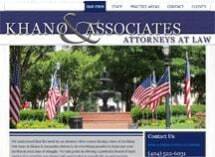 Whether you are facing overwhelming debt, suffering harassment from creditors, stand accused of a criminal offense or simply need an attorney to oversee a real estate purchase, the attorneys at the law firm of Khano & Associates will provide the guidance and support you need. If you are interested in learning more about how we can help you overcome your financial or legal challenge, you can do so during a free initial consultation at our Marietta law office.